Okay! Okay! We know Chilean Sea Bass is one of the most politically incorrect fishes to bring into our home, let alone our mouths. We could not help ourselves, it is so delicious, so moist, so buttery and ever so flavorful! Sinful as it melts on your taste-buds, literally. I coated the fillets with butter and a masala sea salt combination wrapped them in parchment paper and roasted until flaky and delicious. During the last 10 minutes of roasting the fish, I added a bundle of asparagus that was lightly drizzled with olive oil. 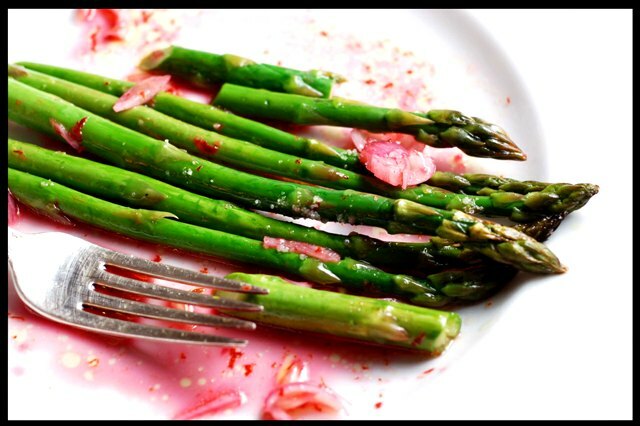 Before serving I tossed the lightly roasted asparagus with a blood orange vinaigrette and sprinkled with chardonnay sea salt. In a small jar or bowl combine all ingredients except asparagus and shake to combine. Wash asparagus and loosely wrap in foil, drizzle with olive oil and wrap the foil to seal. Set on a cookie sheet and place in the oven. Roast for 10 – 15 minutes until lightly roasted, still slightly crunchy and dark green. Before serving toss with vinaigrette. 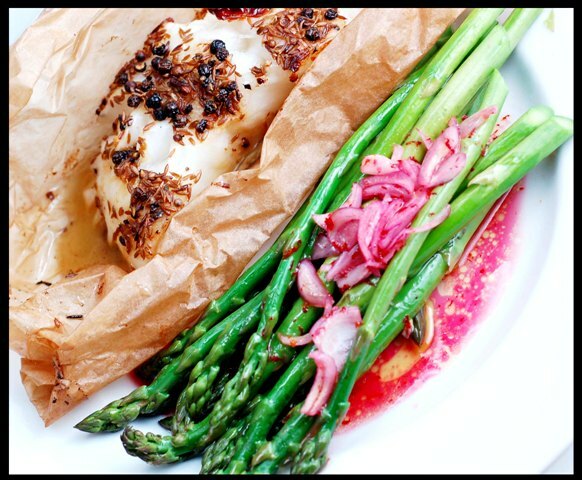 2 Responses to "Roasted Chilean Sea Bass with Baby Spring Asparagus"
Nice recipe! Masala would be very nice with this fish. As a note, there is a certified sustainable chilean sea bass available so we can enjoy this fish (in moderation). The Seafood Watch Program has a paragraph about the fishery for concerned consumers.